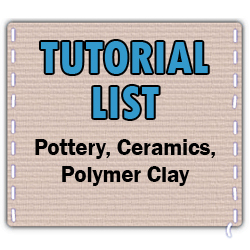 Here are links to an almost completely thorough list of the tutorials that are available on Craftster's Pottery, Ceramics, Polymer Clay boards. Some tutorials were excluded for lack of clarity or pictures and no tutorials listed on other sites were included. U.S. Packaging & Wrapping LLC. That is cool indeed! Thanks for the list! This is the very helpful information. Thanks for sharing. For home decoration, we also can use some vases for like flower decoration, candle decoration and use them as a centerpiece also. Can you please give me suggestion how we can give them a much better look?